Amaranth seeds need warm soil to germinate and can be damaged by spring frosts, so wait until the soil has begun to warm to plant this crop. Mature plants are easier to harvest after a light frost in the autumn. Plant from mid spring to early summer by sowing seeds barely covered with soil in uniform rows. Keep soil moist until the seedlings sprout. Weed by hand until the plants are 10cm (4 in) tall, gradually thinning plants to 45cm (18 inches) apart. As the plants grow, they will shade out most summer weeds. Amaranth is closely related to the weed known as red-rooted pigweed, so it can be difficult to tell the two plants apart. 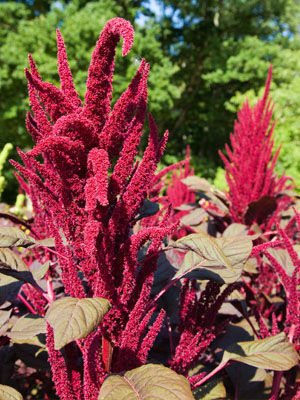 Amaranth grows to 4 to 6 feet (1.2 – 2 m) tall, and tall varieties may need staking to hold them upright when they become top-heavy with maturing seed clusters. Varieties with light-coloured seeds usually have the best flavor. When you see birds pecking at your amaranth, or when seeds fall away from the cluster when gently rubbed, it is time to harvest your crop. When the weather is dry, bend over seed heads into a large bucket and clip them off. Working in a dry place, strip off the seeds, use a fan to winnow out debris, and spread the cleaned seeds on screens or trays to finish drying indoors. Flea beetles often make small holes in leaves, while larger holes may be the work of night-flying beetles or Japanese beetles. Plant bugs (Lygus bugs) can cause serious damage when they feed on almost-mature plants.